I wrote earlier this year that August is the best time to be in Edinburgh, Scotland, thanks to all the festivals taking place during that time of year. Why? Because I've just experienced the Scottish capital during the New Year's festival of Hogmanay, and It. Was. Awesome. For hundreds of years, the Scots have been ringing in the New Year by celebrating “Hogmanay,” or the last day of the year. The name, in fact, can be traced all the way back to the year 1604, with some of the accompanying traditions going back much further. Traditions having to do with Vikings and fire and friendship and food. The modern-day Hogmanay celebrations (which just celebrated their 20-year mark) actually aren't a whole lot different. There's still fire and food and Vikings – along with much, much more. There are even bloggers in kilts! Unlike other well-known New Years celebrations around the world, Hogmanay doesn't last just one night. Yes, New York might have a giant party in Times Square and Sydney might have spectacular fireworks. But does either one of those have Vikings? Or ceilidh dancing? Or fireworks above a castle? Edinburgh does, though. 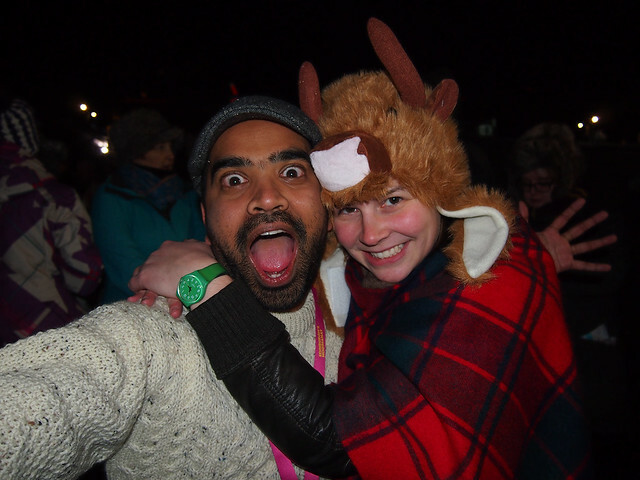 Read on to learn about some of the highlights of my Hogmanay experience. 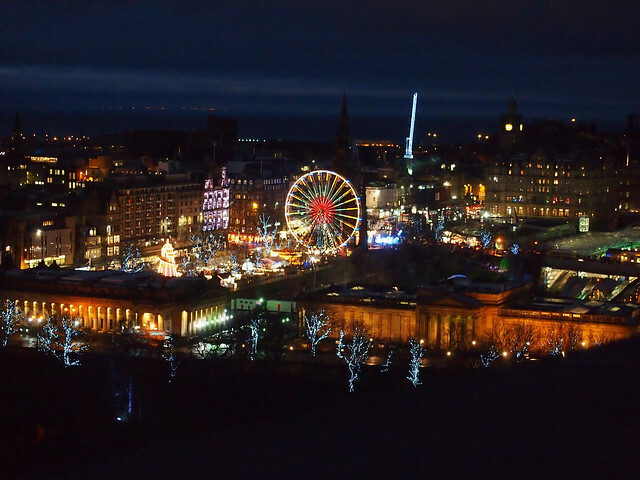 Edinburgh around the holidays is just plain fun. 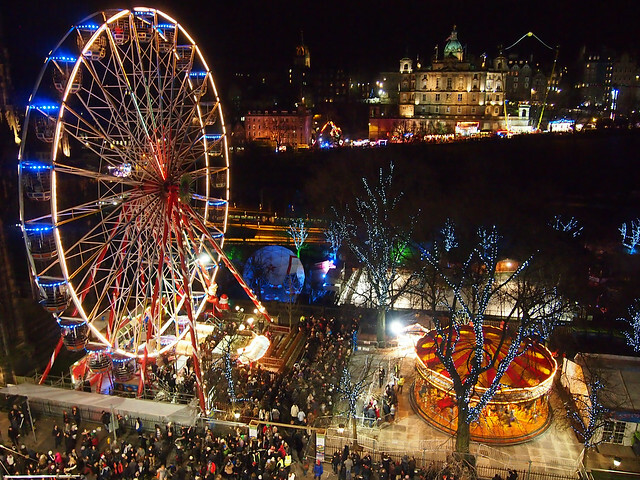 There's a German market on The Mound where you can ride a Ferris wheel or sip some mulled wine. There's an ice skating rink that's fun for all ages. And there's a street carnival nearby that adds some additional color to the city. 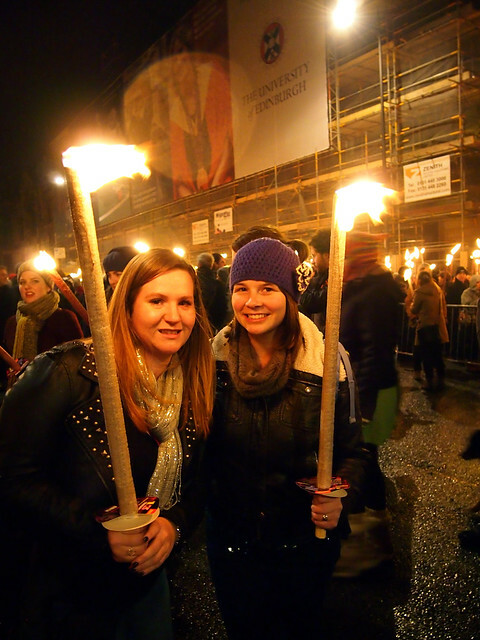 Each year on Dec. 30, thousands gather in Edinburgh for the Torchlight Procession. This isn't an event people generally know about unless they've been to Hogmanay, but it's 100% worth knowing about. 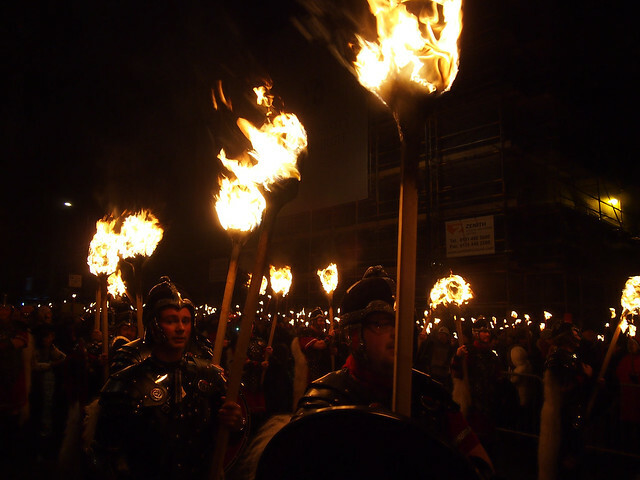 Thousands of people march from the city center to Calton Hill with flaming torches of burlap and wax, led by pipes and drums and the Up Helly Aa' Vikings from the Shetland islands. Yes — fire AND Vikings! The year I participated, over 40,000 people either took part or watched the procession, which ended with the Son et Lumiere finale atop Calton Hill. On New Year's Eve is when it all happens. And when I say all, I mean ALL. The Hogmanay events on NYE are ridiculous. First there's the Street Party, with music and food and drinking (I mean, it's not Scotland without the drinking! ), turning Princes Street into the place to be for more than 80,000 people. 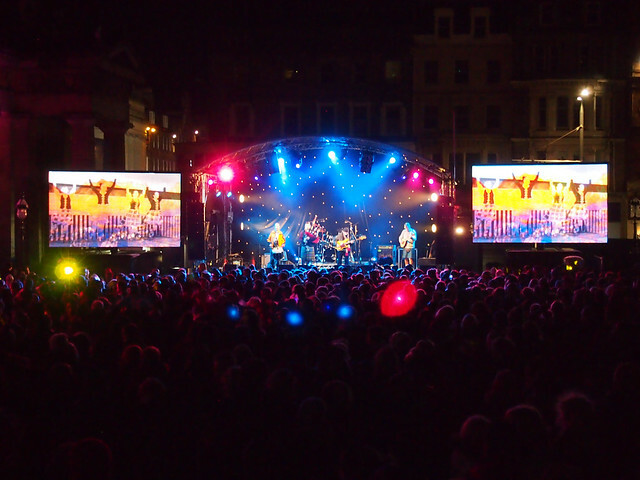 There are also concerts going on on multiple stages throughout the city, as well as a massive ceilidh dance. The headliners the year I went were Simple Minds (made famous by their “Breakfast Club” theme, “Don't You (Forget About Me)”). They played on a giant stage in the gardens below Edinburgh Castle — you certainly couldn't beat the location! And of course there are the fireworks at midnight. 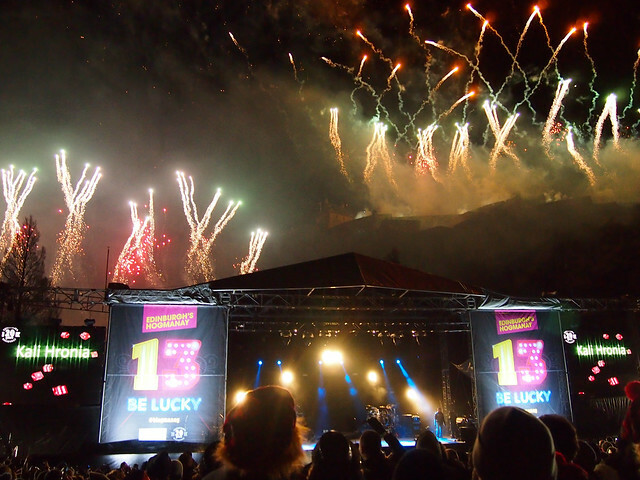 With sneak previews every hour between 8 p.m. and midnight, the display to ring in 2013 did not disappoint — the ground was literally shaking underfoot at one point as thousands of colorful fireworks burst above Edinburgh Castle. Kudos to the guys who spent 6 days setting the show up — it was fantastic. The fireworks were followed by everyone linking arms and singing “Auld Lang Syne” — a tradition that began right here in Scotland. I can't think of a better way to ring in a new year than throwing myself into a freezing cold river — can you? 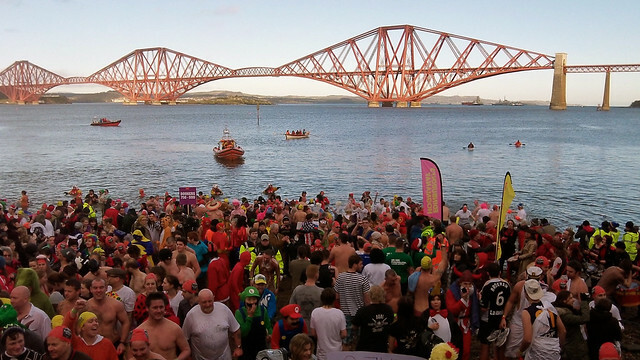 This year, I took part in the Loony Dook on New Year's Day, which consists of about a thousand people in silly costumes parading through the town of South Queensferry and then plunging into the River Forth. Yes it was cold, and yes it was crazy. But it was also SO MUCH FUN. Me and my fellow blogging loons, Nadine and Jane. 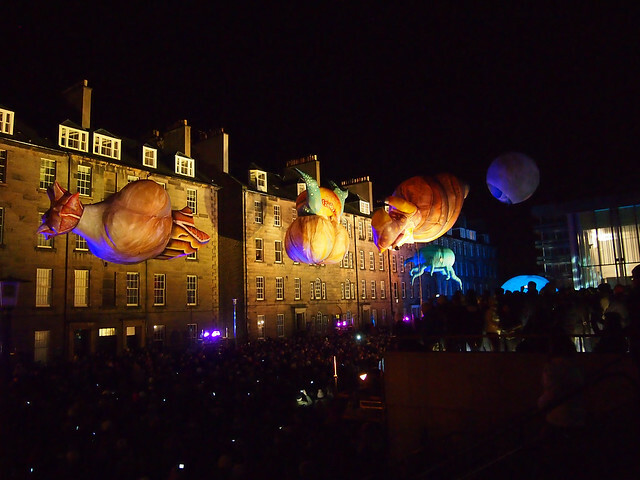 On New Year's Day, there were all sorts of things going on around Edinburgh, from a triathlon, to “Dogmanay,” to various performances all around the city. The day came to a close with The Big Bang, a trippy visual art performance that was supposed to portray the history of the universe. Considering how little I had known about Hogmanay before agreeing to take part in #Blogmanay, it's safe to say that the event took me by surprise time and time again. Each day of the celebrations was memorable in its own way, and this is definitely an event I'd recommend if you want to have an epic New Years abroad! 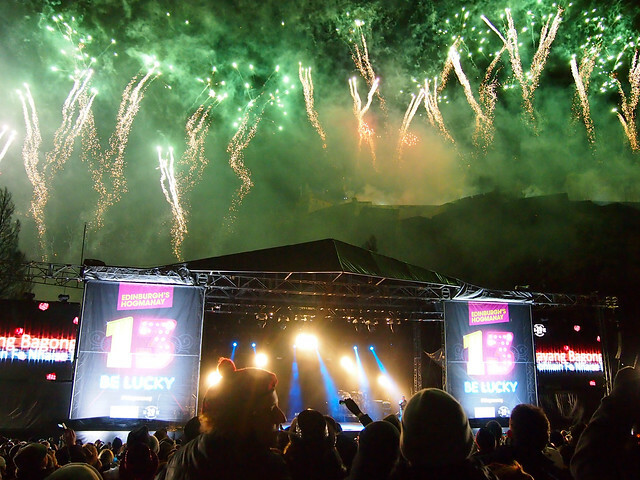 Is Hogmanay going on YOUR bucket list? 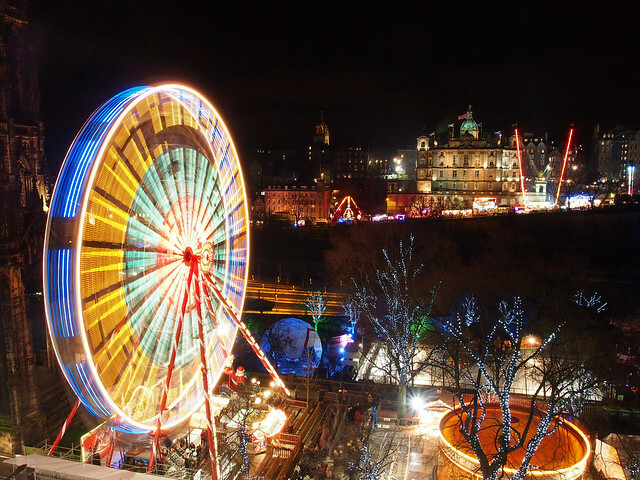 This campaign is brought to you by Edinburgh’s Hogmanay and is supported by VisitScotland, ETAG, Edinburgh Festivals, Haggis Adventures and Skyscanner. The campaign bloggers were sourced and managed by iambassador. As always, though, all opinions are my own. Looks like so much fun! I think I would have skipped the Loony Dook though!!!! Can’t wait to read about your Latin American adventures!!! Ah but the Loony Dook was so much fun!! I am thinking of spending new year in Edinburgh this year. Beats staying at home watching the television. Looks like you had a great time. DO IT! It most definitely beats sitting at home and watching TV. Ahhh! This. Is. Awesome! I didnt expect so much fun! I will try to make it there this new year eve. Enjoyed the story very much! But yes, this was SO MUCH FUN. I would do it again in a heartbeat. …except for the “jumping into the freezing river” part. Ice cold water’s where I draw the line. How large was the street carnival? And by the street carnival, do you mean the Street Party? This year they had like 80,000 people there! No, I mean the street carnival – the one you said was near the ice skating rink? Everyone agrees it was there, but absolutely nobody is talking about it… which is a shame. Carnivals (and street fairs/county fairs) are some of my favorite events. Maybe I’m weird that way. Ah, gotcha. Well it’s very very small. Less than a block, I’d say – which is perhaps why no one is saying much about it! They had a few rides and a few stands selling food, but not much else. Well, yes, that would be a good reason why nobody would be talking about it! This is totally a gnarly way to celebrate the New Year. You are right, how can you beat fireworks over a castle?! And the way they dress up the city with all of the lights is so cool. We have a “polar plunge” we do here near DC that I’ve always thought about participating in, but in the icy Scottish waters — You’re crazy! This sounds like a pretty epic event. I had never even heard about it until all of the recent blogger chatter on social media. Good. Then we did our jobs. 😉 Really, though, it’s a very cool New Year’s celebration! Wow!!! That sounds like ridiculous amounts of fun. I definitely need to experience that awesomeness before I die – onto my bucket list it goes! Hahaha. It most certainly deserves a spot on any bucket list! Looks like a blast and probably beats standing around in the freezing cold waiting for and then watching fireworks at the Space Needle. I was just thinking this year that I need something new for a New Year’s celebration plus I’ve always wanted to go to Scotland, so…okay, I’m sold. Perfect, I’m glad I’ve sold you on Hogmanay! To be fair, it COULD well have been cold and raining/snowing for the fireworks… but we lucked out! Even in bad weather, though, Hogmanay would be so much fun! Love how the men are the one’s moaning about the ice-cold plunge…. oh right. Shrinkage. Hahaha. There were plenty of men jumping into the river, too, though, don’t you worry! Happy New Year to you, too! 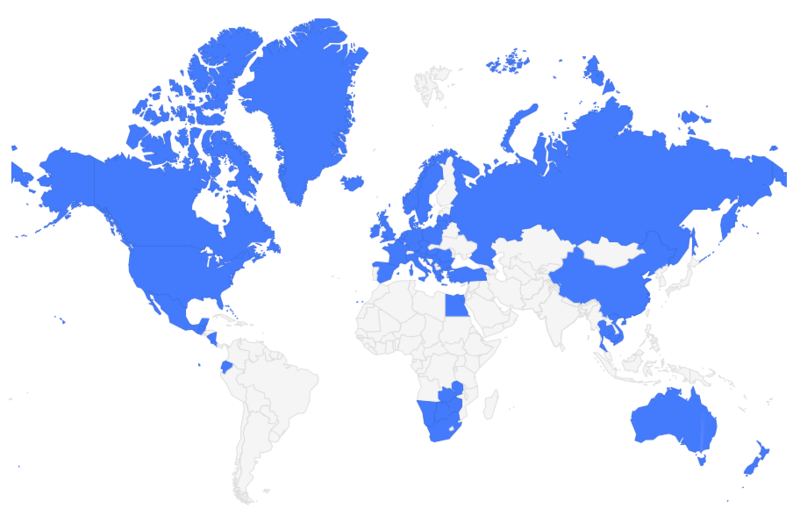 You guys should consider going to Hogmanay next year – you’re not all that far away now that you’re based in Europe! It absolutely was! The biggest New Year’s party I’ve ever been to, for sure. I think I’ll have a hard time topping this one! That seems epic! No kidding, screw Times Square (everyones must do as a child). This looks like tons of fun!!! Glad you took advantage of everything, though I might have skipped the freezing swim. And I love swimming! Honestly I”m not sure Times Square could live up to Hogmanay! There was just such a variety of things going on – no other celebration I know of is so diverse! Great to hear! CNN agrees – they’ve named Scotland as the top travel destination for 2013! Looks like a great way to celebrate New Year. 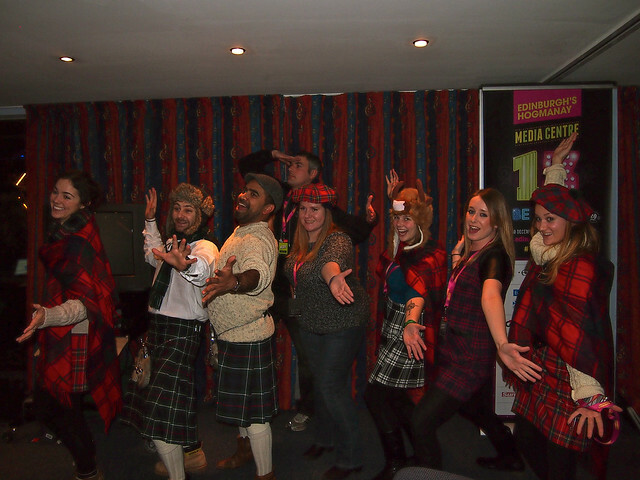 The Scottish sure no how to party, but I think I’ll give submersing myself in freezing waters the next morning a miss. Lol there’s no love at all for the Loony Dook! Just you wait until I write about it… it was so much fun! Neve heard of it before, and would usually not look for something like that, yet I really like how there seems to be activities and attractions for various tastes. Yeah, the variety of activities was great! And the fact that the celebrations last for days was very cool. Definitely do it!!! The most fun I’ve ever had at New Year’s. Thanks to this wonderful post I got inspired to do the same for NYE of 2015. I was wondering though if you can combine Hogmanay with a citytrip to Edinburgh or is everything closed for the holidays? 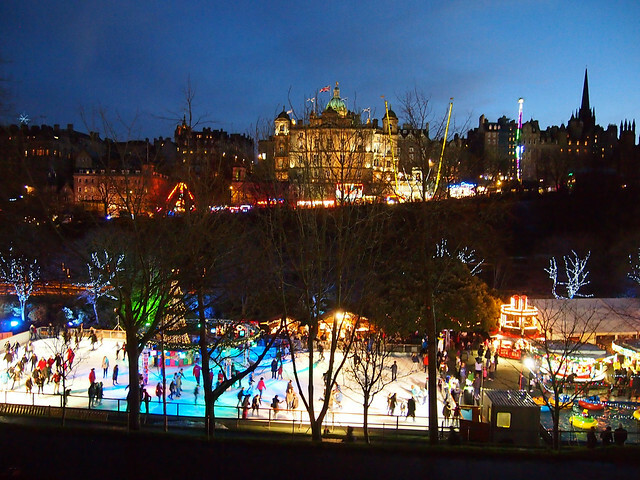 You definitely can pair a Hogmanay trip with a trip to Edinburgh and the rest of Scotland! The city is a popular New Year’s spot in Europe, so you don’t have to worry about things being closed!